Tuscany Small Group Tours with Amber Road» Our 17th year! The incredible beauty of Tuscany & Umbria‘s hill towns provide the backdrop for the innumerable highlights of this trip. The tour begins with three nights in Pistoia, an off-the-tourist-radar jewel. 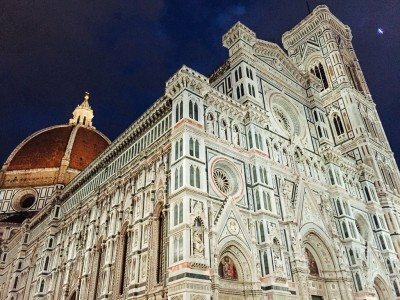 In Florence we’ll experience extraordinary art with Michelangelo’s David, an architectural walking tour and the Uffizi museum. 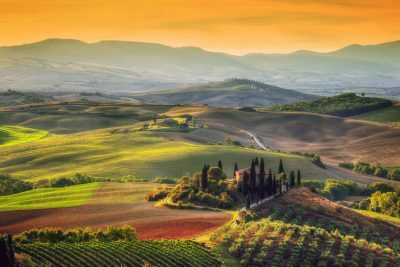 Pienza, pici pasta and the landscapes of the Val d’Orcia will host us for another three nights’ stay. We’ll taste Brunello wines at Montalcino and also take in sunny Cortona, an ancient Etruscan city-state. 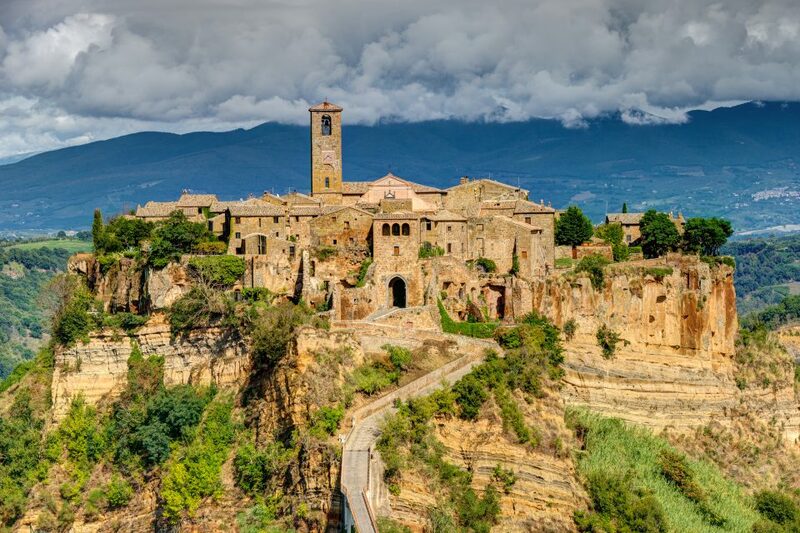 Due to erosion and earthquakes, we’ll have to cross a footbridge to reach the inland island town Civita di Bagnoregio. In Umbria the Basilica of San Francesco awaits us at Assisi. We’ll cross the impressive aqueduct/bridge in medieval car-free Spoleto. We’ll visit magnificent Orvieto, perched on a 300 meters high cliff of tufa rock. 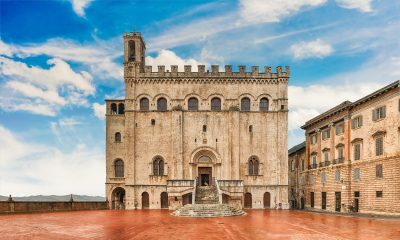 Our two-night stay in Gubbio, another famous medieval town, will be in a former 17th century monastery. At Urbino we’ll wander the halls of the most beautiful Renaissance palace in all of Italy. And lastly, a visit to the Piazza del Campo of Siena and gelato in the main square of 13th century San Gimignano. Join us for the best food and wines and much, much more! Arrival at Florence airport, where you will be met by your tour manager and transferred to Hotel Villa Cappugi (3 nights), located in the foothills just outside of Pistoia. Located in northern Tuscany between Florence and Lucca, Pistoia is a little-touristed jewel of a town. 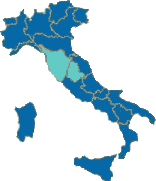 Existing since before Roman times it became an independent republic during the medieval era before being annexed by Florence. Surrounded by one of the largest plant and tree nurseries in Europe, today it has a charming historic center with inviting pedestrian lanes and beautiful squares, vegetable and flower markets. 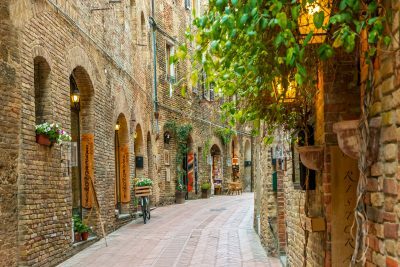 We’ll be making a late afternoon trip for a guided exploration of the historic district followed by a welcome dinner of local Tuscan specialties and wine tasting at its finest restaurant. 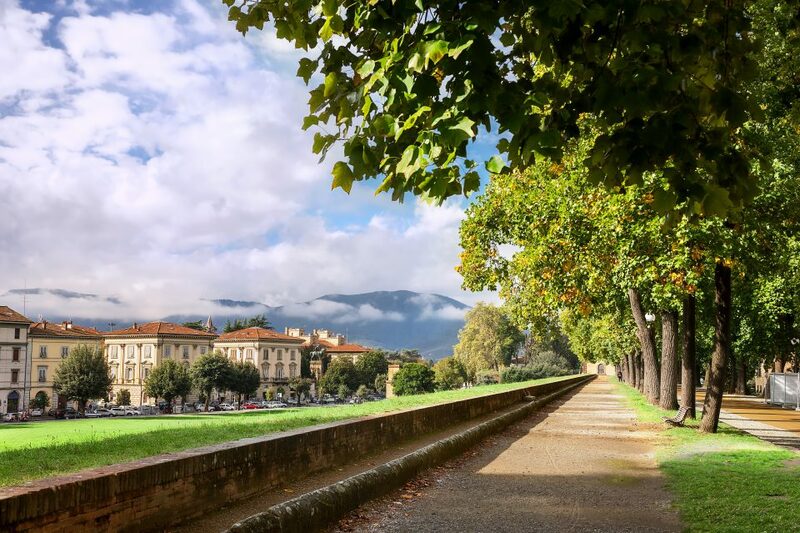 Our excursion today is to Lucca, an elegant city of art ringed by a 4 kilometer massive wall that took 150 years to build. 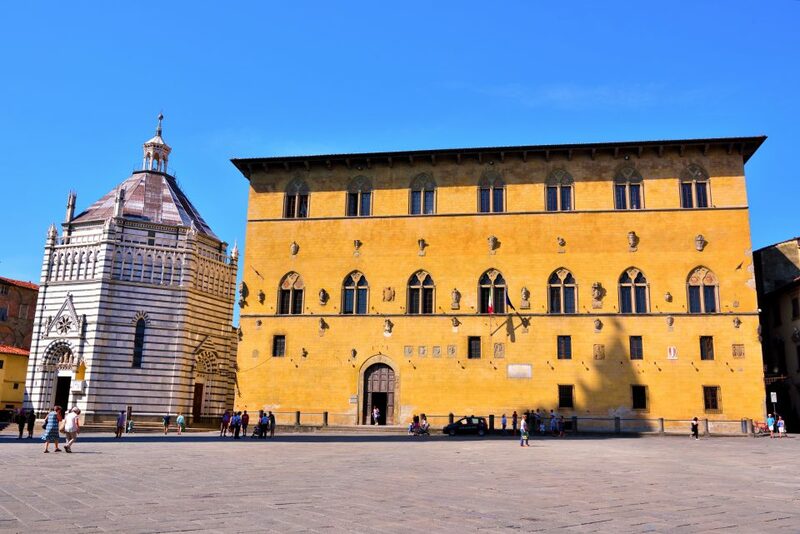 The second largest city-state after Venice and the only major city in Tuscany to resist the might of Florence, Lucca finally succumbed to the forces of Napoleon and was ruled for a time by his sister Elisa Bonaparte and was later home to the composer Giacomo Puccini. Morning walking tour of the city with our local guide. 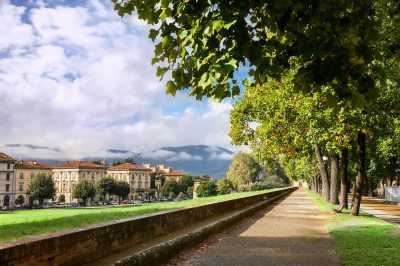 In the afternoon you’ll have time to walk the pedestrian path atop the walls, wander Lucca’s ancient Roman streets or browse stylish shops. Early evening we’ll dine at a Tuscan style pizzeria in the hills above Pistoia. This morning will find us in the historic district of fabulous Florence, birthplace of the Renaissance. Our first visit is to the Accademia Museum to see Michelangelo’s incomparable David. 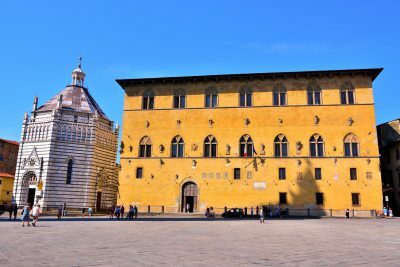 Then our local guide will take us on an historical and architectural walking tour that covers the Piazza del Duomo, Piazza della Signoria, Piazza Santa Croce, Ponte Vecchio and more. After some free time for your own explorations, we have an afternoon appointment at the Uffizi, the most famous art museum in Italy, where you’ll find masterpieces by Botticelli, Raphael, Leonardo and Caravaggio. Leaving the plains of northern Tuscany for the rolling hills of the south, our first stop is for a cappuccino inside the 13th century walled fortress of Monteriggioni, the northernmost citadel of Siena in wars against Florence. We’ll then pass through the Crete Senesi (Siena clay hills) for a visit to the abbey of Monte Oliveto Maggiore, a Benedictine monastery set amongst forests of cypress, pine and oak. 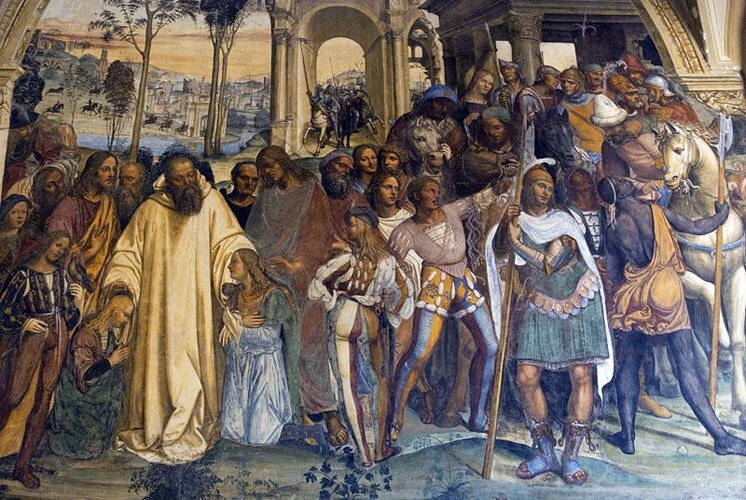 The Great Cloister features the famous cycle of frescoes depicting the life of St Benedict by Signorelli and Sodoma. Included lunch. Then we move on to the renaissance town of Pienza, the “ideal city” constructed by Pope Pius II, overlooking the cypress-lined hills of the stunning Orcia Valley. Our lodging is Hotel Corsignano (3 nights) located just outside the town walls. Brunello wines are considered among the most prestigious of Italy. We begin this morning with a tour of an unique Brunello winery run entirely by women. 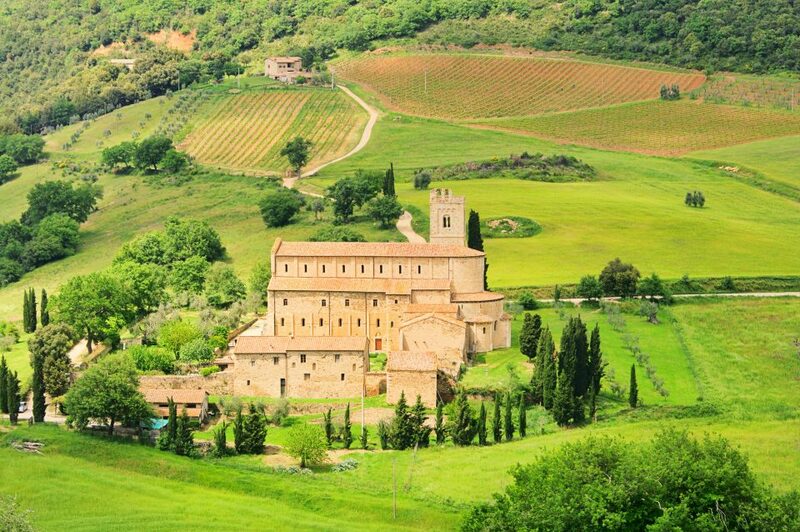 Then we’ll take in the hill-town and imposing castle of Montalcino, final bastion of the the Republic of Siena, with some of the most scenic settings on our tour. In the afternoon we’ll stop by the beautiful 9th century abbey Sant’Antimo, said to have been founded by Charlemagne. Today’s first visit is to the unique medieval village of Civita di Bagnoregio in the region of Lazio, isolated by earthquakes and erosion creating an inland island of nineteen inhabitants, accessible now only on foot across a 300 meter bridge! Spectacular Orvieto sits atop a 325 meter outcrop of volcanic tufa rock, with thousands of caves underneath the city, dug out during Etruscan, Medieval and Renaissance times. We’ll explore them on a fascinating tour of Orvieto Underground. 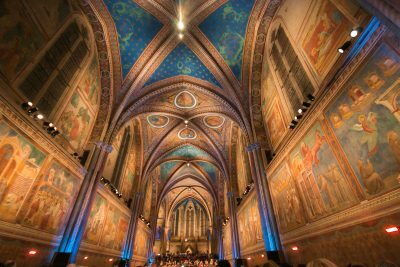 After lunch our local guide will take us through one of Italy’s most famous Gothic cathedrals, 300 years in construction, featuring the San Brizio chapel with the wonderful frescoes of Signorelli. We visit three very interesting small Umbrian villages, beginning with a guided tour of the Olive Oil Museum at Torgiano, followed by a visit to Deruta, famous for its ceramics. 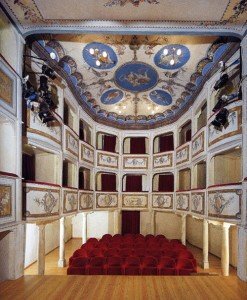 After time for shopping and lunch we’ll visit the smallest theater in the world, the Teatro della Concordia at Monte Castello di Vibio. Then we head for romantic Spoleto, whose 3000 year past includes Umbrians, Romans, Goths, Lombards, Franks, emperors and popes. We’ll be staying for 2 nights at the Hotel dei Duchi located in the upper town near the ancient Roman Theater. Included dinner at a nearby ristorante where we’ll taste the famous local pasta strangozzi. 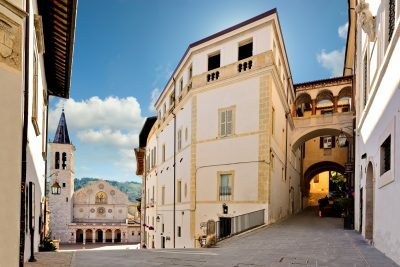 There is a wealth of history to explore within Spoleto – its massive 14th century fortress, cathedral, Roman walls and medieval piazzas, the amazing aqueduct-bridge, fine museums and churches, not to mention the maze of medieval town planning. 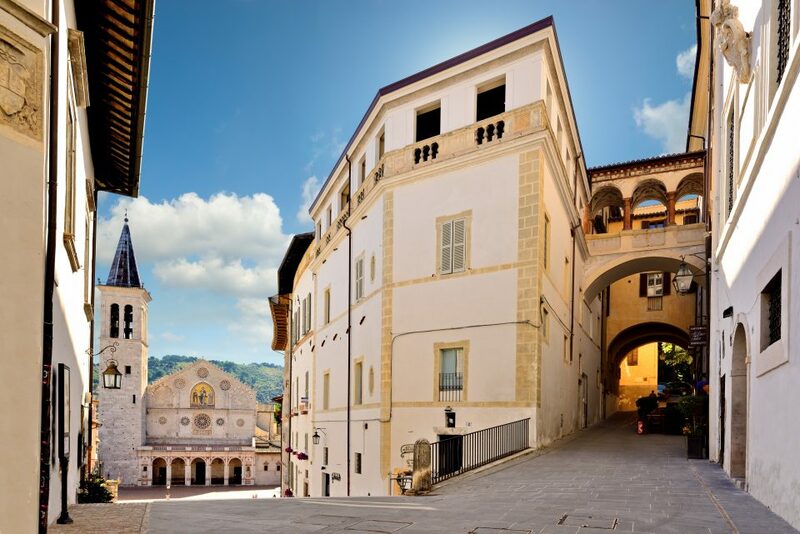 For the last ten years Spoleto has undergone an ambitious project to become a model città senza auto, car-free city. Twenty two underground moving sidewalks, fourteen escalators and seventeen elevators transport residents and tourists directly into the heart of the city. Streets that were designed for people centuries ago have now been returned to pedestrian use only! 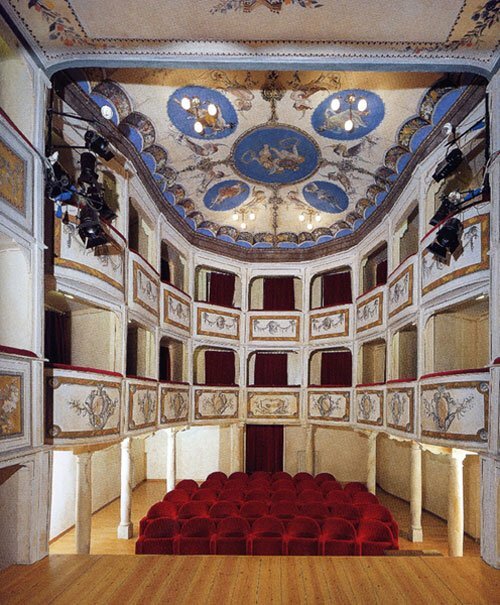 Spoleto is home to the Festival dei Due Mondi (Two Worlds Festival), a music and opera festival held annually since 1958. We begin today with a guided walking tour, followed by a tasting of Umbrian delicacies and wines at a local vineria. Afternoon and evening on your own. Our pilgrimage this morning is to Assisi and the incomparable Basilica di San Francesco and its brilliant cycle of frescoes on the Life of Saint Francis by Giotto. 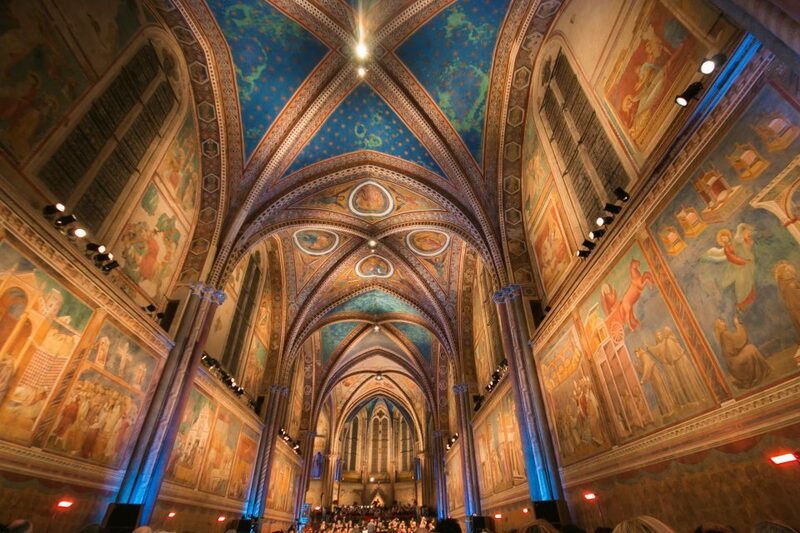 Assisi has even more to offer with its 2,000 year old Piazza del Comune, the first century B.C. Temple of Minerva, numerous churches, Duomo and 14th century fortress, the Rocca Maggiore. In the afternoon we’ll move north to Gubbio, perhaps the best preserved of medieval Umbrian towns, laying against the slopes of Monte Ingino. We’ll be staying for two nights at the 17th century former monastery, the Park Hotel ai Cappuccini. Afternoon visit to the Palazzo dei Consoli Museum and the Roman amphitheater. Today we’ll take a trip into the region of Le Marche to visit Urbino whose main attraction, besides being one of the most beautiful medieval towns in central Italy, is the enormous Palazzo Ducale of Duke Federico which now houses the National Gallery of Le Marche. Here we will spend one of the most rewarding mornings of our tour. Urbino is also home to a very beautiful cathedral and the natal house of the Renaissance painter Raphael. Included lunch in Urbino at a tavern where our groups have thoroughly enjoyed themselves for the last 15 years. Returning to Gubbio we’ll ride the funivia (bird-cage lift) to the top of the mountain to enjoy the views and see the Basilica of Saint Ubaldo, whose 900 year old remains are still on display. Cortona, the oldest continuously inhabited hill town in Italy, is our first destination. After a visit to the Etruscan Museum you’ll have the morning free for a delightful exploration of winding alleys, pleasant squares, small cafés and restaurants. After lunch we’re off to San Gimignano, a tour favorite with its many towers, lovely scenery and enjoyable evenings. We’ll be staying at the 13th century Hotel La Cisterna (two nights), set in the main square of town. 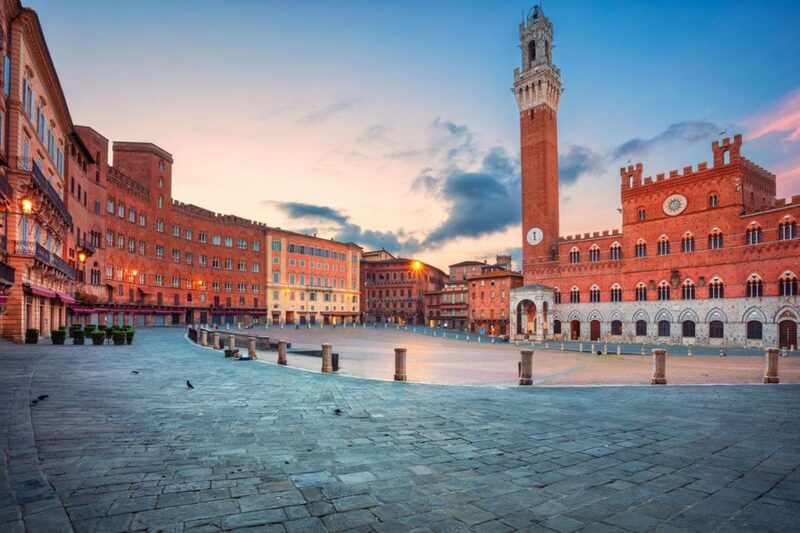 Our last excursion is to the enchanting Gothic city of Siena, home to one of Italy’s most beautiful squares, the Piazza del Campo and what-was-to-have-been the largest cathedral in the world (interrupted by the Black Death). Our guide will walk us through Siena’s fascinating medieval story that, in surprising ways, lives on today. Late day free in San Gimignano prior to the farewell dinner and last gelato. Our restaurant is located in the historic center with stunning views over the valley. Morning transfers to Florence airport, train station & hotels. Pisa airport on request. Day 1 transfers from Florence Peretola Airport are at 12:00 and 14:30. Pisa on request. Most medieval towns were built as hilltop fortifications, so you will find a lot of uphill walking. Be prepared to spend a few hours a day on your feet. Transfers from Florence Airport on Day 1 (available only at scheduled times). Morning transfer from Pisa airport to Florence airport available upon request. All ground transportation Days 2 to 13, including tour manager and drivers. Transfers on Day 13 from San Gimignano to Florence airport or train station. 12 nights hotel accommodations with breakfast. 6 dinners and 2 lunches including beverages (wine or beer or soft drinks and water). Admissions to all sites visited as a group, as listed in the Highlights of the tour itinerary. The transfers from Florence Peretola airport to our first hotel destination will be at noon and 2:30pm. For all other arrival times: the hotel is located 4 km. outside of Pistoia. It is about 35 minutes by taxi from the Florence airport or 50 minutes by train and taxi from the Florence train station. Upon request we will send you detailed arrival instructions. Most medieval towns were built as hilltop fortifications, so you will find a lot of uphill walking. Be prepared to spend a few hours a day on your feet. This tour is not suited for anyone who has problems with knees, back, heart, obesity or those who cannot manage steps and moderate inclines. Age is not important as long as you are reasonably fit and a good walker. If you have any difficulty walking this is not the right tour for you. We have space available for one or two singles on each of our tours. They are provided with single-use double rooms. The additional single supplement cost is 400 euros. Please contact us for availability prior to booking.